Little Bailley, the child super soldier experiment. Born in a small African village, this mysterious girl was experimented on at a very young age, by an unknown military group, to become a powerful super soldier. She was rescued by Flo, the military service dog, and has since been under close observation by the army. Bailley, who is beginning to show signs of the symptoms, has now grown a tail and animal ears, though the species remain unknown. Furthermore, her aim, speed and reflexes have also excelled to near super-human level. Way too young for combat, she has been enrolled into preschool, and helps the army train and maintain all the service animals, including Flo and Maisy. She’s a girl scout, she’s a very fast learner and has become a child prodigy, envied by all the other preschool girls. Arrogant, with bragging rights, she has every reason to be proud and cocky………. *crinkle-crinkle*………except she can’t pass her Potty Training Test……..A side effect from her super soldier testing, Bailley seems to have lost all control of her bathroom urges, and has become desperately dependent on diapers to prevent accidents. Perfectly flawed, she has become very nervous and self-conscious about her padding, and experiences much ridicule by students when she needs to get the teacher to change her diaper. She often hides from class, preferring to hang out with Flo and the other service animals, seeing that Flo and Maisy are also incontinent. Its only around other padded kids and animals, where she feels most comfortable. Her dream is to one day graduate to training pants. Poor little Bailley it seems like she is going to be forced to wear diapers for the rest of here life. Now when she have ended up being incontinent. Swimmates are the first disposable swim briefs especially for bowel containment. Designed to be worn discretely underneath a regular swimwear then torn away and disposed of after swimming. Swimmates won’t swell up from the pool water, they don’t come apart and are Latex-free. Feel confident, enjoy the water, and experience the advantages of buoyant exercise without the worry of embarrassment. It has inner leg cuffs designed to secure bowel incontinence, Blue rear waist elastic moisture barrier and full-rise waist panel for a perfect fit making it easy to pull up and down. With a wide range of sizes to fit youth, teen and adult swimmers. S = 56-91cm(22-36″), 36-57kg(80-125lbs), 22 Pack. M = 86-122cm(34-48″), 54-79kg(120-175lbs), 20 Pack. L = 112-137cm(44-54″), 77-95kg(170-210lbs), 18 Pack. XL = 122-168cm(48-66″), 95-113kg(210-250lbs), 14 Pack. XXL = 157-203cm(62-80″), 113+ kg(250+ lbs), 12 Pack. Tranquility Swimmates Disposable Swim Diapers can you order from abdlfactory.com and the price is €40. Ensure Demand-supply of incontinence aids without additional payment! Die Unterzeichner dieser Petition fordern, dass Menschen mit Inkontinenz ohne aus eigener Tasche aufzuzahlen die Inkontinenzhilfen in der Qualität und Menge bekommen, die sie für ihre Versorgung benötigen und die ihnen gesetzlich zustehen. Dazu sollen Krankenkassen Verträge schließen, die Patienten ein Wahlrecht zwischen verschiedenen Anbietern und Produkten ermöglichen. Ausschreibungsverfahren für Inkontinenzhilfen sind so anzupassen, dass der Schweregrad der Inkontinenz bei der Ausschreibung berücksichtigt wird. Jeder Mensch mit Inkontinenz ist anders. Darum hat auch jeder Mensch einen unterschiedlichen Bedarf bei der Inkontinenzversorgung. Obwohl Menschen mit Inkontinenz laut Gesetz einen Anspruch auf eine angemessene Versorgung mit Inkontinenzhilfen haben, werden viele Betroffene heute nicht mehr in ausreichender Menge und Qualität versorgt. Sie müssen vielmehr aus eigener Tasche aufzahlen, um weiterhin die Inkontinenzhilfen zu bekommen, die sie benötigen und gewohnt sind. Krankenkassen können durch Ausschreibungen über 20 Prozent Kosten einsparen. Aktuell wurden Verträge zu einer Monatspauschale von teilweise EUR 12,50 geschlossen. Auf diesem Preisniveau ist eine bedarfsgerechte Versorgung nicht zu gewährleisten. Inkontinenz kann so zur individuellen Qual werden. Als Folge eines unzureichenden Inkontinenzschutzes nässen Patienten sich unnötig ein. Dadurch steigt das Risiko von Infektionskrankheiten sowie von Druckstellen und Druckgeschwüren. Die sozialen Auswirkungen sind ebenso gravierend: Menschen mit Inkontinenz genieren sich und können am sozialen Leben nicht mehr teilnehmen. Ihre Lebensqualität wird massiv beeinträchtigt – ihnen bleibt nichts anderes übrig als den Mehrbedarf per Aufzahlung selbst zu übernehmen. Inkontinenz wird dadurch nicht nur zu einem gesundheitlichen, sondern auch zu einem sozialen Problem. Eine angemessene Versorgung der Patienten kann nur gewährleistet werden, wenn der Schweregrad der Inkontinenz bei den Verträgen und Ausschreibungen verpflichtend berücksichtigt werden muss. Eine Unterteilung in Produktgruppen bzw. -arten ermöglicht eine Versorgung der Patienten nach ihren individuellen Bedürfnissen sowie eine differenzierte Preisgestaltung. So können qualitativ angemessene Produkte zu sachgemäßen Preisen angeboten werden. Außerdem ist die Beratung der Patienten von den wirtschaftlichen Interessen zu trennen. Die Festlegung des Bedarfs muss entsprechend durch den verordnenden Arzt erfolgen. Eine bedarfsgerechte Versorgung kann somit sichergestellt und grundlose Aufzahlungen verhindert werden. Below is a translated version of the text you see above. The signatories to this petition demanding that people with incontinence without out of pocket enumerate the incontinence aids in the quality and quantity get that they need for their care and they are entitled to by law. These should include health insurance contracts that allow patients a choice between different vendors and products. Tendering procedures for incontinence aids must be adapted so that the severity of incontinence is included in the tender. Every person with incontinence is different. Thus each person has different needs in incontinence care. Although people with incontinence have a right to an adequate supply of incontinence aids according to the law, many sufferers are no longer supplied in sufficient quantity and quality today. You need to pay extra out of pocket rather to continue to get the incontinence aids they need and are used to. Health insurance can save by tender for 20 percent cost. Current contracts were signed to a monthly fee of partially EUR 12.50. At this price level Adequate supplies can not be guaranteed. Incontinence can be so for individual agony. As a result of an inadequate incontinence protection drench patients unnecessarily. This reduces the risk of infectious diseases as well as pressure sores and pressure ulcers increases. The social consequences are equally serious: people with incontinence embarrassed and can no longer participate in social life. Their quality of life is severely impaired – they have no choice but to take over as the increased demand by enumeration itself. Incontinence is thus not only a health but also a social problem. An appropriate patient care can only be guaranteed if the severity of incontinence should be considered mandatory for contracts and tenders. A subdivision into product groups or types allows patient care according to their individual needs and differentiated pricing. Thus, appropriate quality products are offered at proper prices. In addition, the counseling of patients must be disconnected from the economic interests. The identification of specific needs must be in accordance with the prescriber. Adequate supplies can thus assured and gratuitous Supplements can be prevented. Text is translated whit help of Google Translater. And help people thats need there health insurance when it comes to there needs for incontinence protection. How to find the right type of incontinence product? This video describe in a weary educational way what type of different incontinence product that is available on the market. Now when it is summer time can it be great to have some swim diapers. Special if you are bowel incontinence. Here is some tips of some swim diapers that you can get from AgeComfort.com. 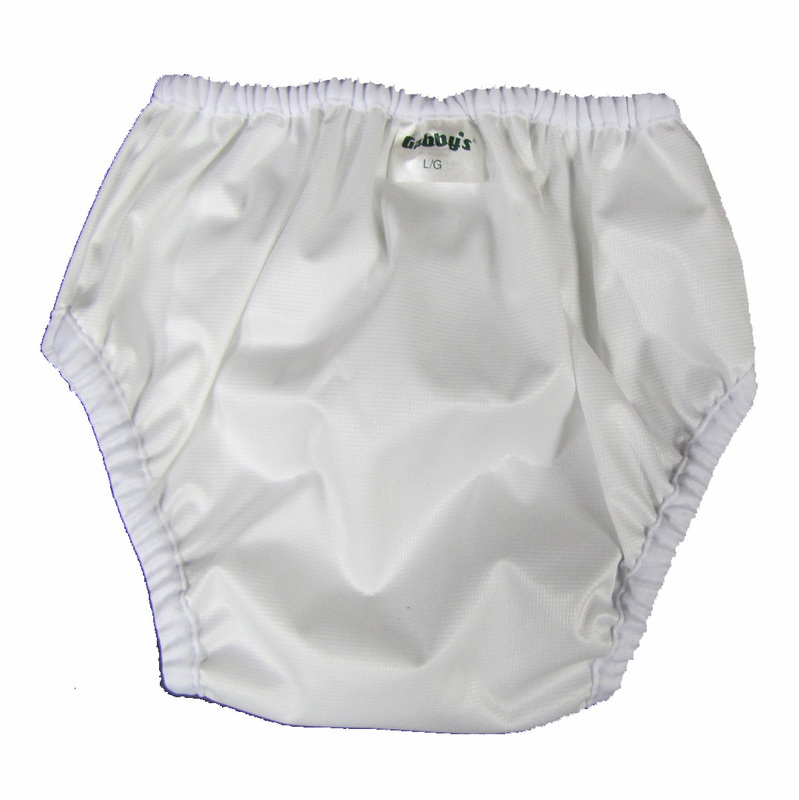 Product Description: Gabby’s Swim Diapers are a great solution for the swimmer with bowel incontinence. In the swimming pool, hot tub or at the beach, Gabby’s Swim Diapers may be worn alone or under a swimsuit. Gabby’s Pull-On Pool Pant has an outer layer of Oxford Nylon which helps prevent the seepage of stool into the water. The inner layer is 100% Cotton Flannelette for comfort and durability. The Pull-On Pool Pant has elasticized legs and waist for a snug fit. May be worn alone or under a swimsuit. You can get the pants here or click on the product above. 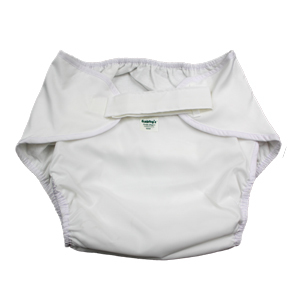 Product Description: Gabby’s Swim Diapers are a great solution for the swimmer with bowel incontinence. In the swimming pool, hot tub or at the beach, Gabby’s Swim Diapers may be worn alone or under a swimsuit. The outer layer is 100% Nylon and the inner layer 100% cotton flannelette, which allows for more comfort and durability. Gabby’s Swim Diapers contain solids while allowing liquids to sieve through, but will not fill with air and balloon out or absorb large amounts of water and act as an anchor. You can get the pants here or click on the product above to get to the site. From the picture i should say that the last swim diapers look the most nice thing to wear. What do you say about swim diapers? Do you have any special that you wear when you are going to the pool or beach? I found this adult diaper app on Google play when i look around the last night. I have bean waiting for some one to release this type of app. Can be a very nice app to have in your mobile phone. Information about the Adult Diapering App. – Tracks daily diaper changes for adults. – Logs diaper size, time, stool type and urine volume. – No permissions are required; 100% safe. Note: Some devices may experience crashes. The developer is trying to fix them as soon as possible. You can help by pressing button “Report” on crash dialog so that the developer can know what and where the bug is. Sending report requires 3G, WIFI or Internet to reach Google Play. Sounds like a very nice and good app. It can be very good thing to have if you wont to keep track on your diaper change. You can find more picture on how the app looks like on Google Play.